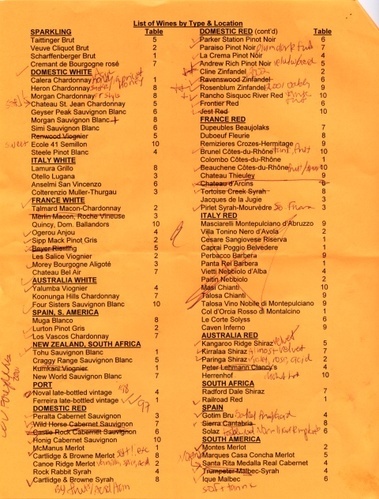 Notes from a fall wine mega-tasting. Amherst Wines & Spirits' Fall Wine Festival is always delightful. If all be true that I do think, there are five reasons we should drink: Good wine—a friend—or being dry—or lest we should be by and by—or any other reason why. Find a good wine merchant. There. If there's any good advice in this whole sprawling collection of essays, that's probably it. We are lucky enough to have found a truly excellent one, Stephen Freedman who owns and runs Amherst Wines & Spirits. That warm, inviting space is stuffed full of fabulous wines. There's something suitable for any occasion and any budget nestled on those wooden shelves, and Steve will point you unerringly to it. Every Saturday afternoon, there's a tasting of something yummy in the store and once a year, Steve lays out a stunning collection of wines for a fall tasting. I think an experienced person, with a well tuned palette and a determination to spit might just be able to taste them all. We have neither that much experience, nor that much determination. So it's important to pick and choose. Something that becomes more difficult the more picking and choosing you've done, of course. A little explanation is in order, especially for the big “X” through the Italian reds. Before some of our Tuscan-loving friends disown us, I'll explain that we decided we had a pretty good feel for Italian reds and that, only because we couldn't taste everything, we'd skip them this year. Similarly, some of the other things that are crossed out are things that we recognized and felt we could skip. Some, I admit, are things we didn't like, but that's a question of personal taste.